Japan as a cultural powerhouse has inspired countless imaginative portrayals. In the realm of fashion especially, we see designs, trends and styles ingeniously realized through the prism of Japanese culture. But fashion wouldn’t be fashion without its provocative imagery. And the concept of Japan takes on many new meanings through the highly stylized world of fashion photography. Here are 12 of the most arresting examples that will guide you through the bewilderment of Japanese fashion! Without a doubt this is one of the best fashion moments in recent history! This radical image was shot by acclaimed photographer Nick Knight for the cutting-edge fashion company Visionaire. 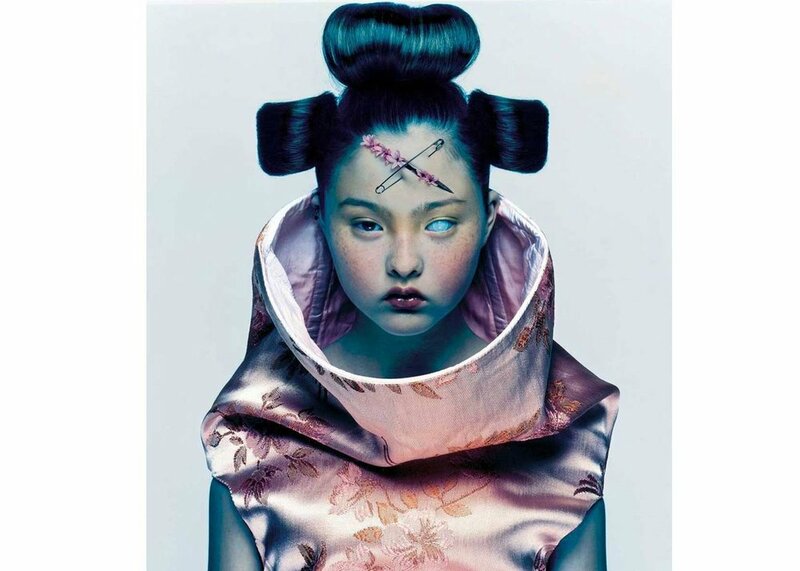 The geisha is wearing Comme Des Garçons by Rei Kawakubo, who also asked the late fashion designer Alexander McQueen to art direct the fashion shoot. It is a rarefied global collaboration that truly delivered with iconic Japan fashion imagery. The star of the shot is of course the fabulous American actress and model Devon Aoki! Japanese fashion photographer Akinori Ito refashions the most famous pumpkin in contemporary art! When fashion meets art, it’s all about creating a cultural gesture that is instantly iconic. The scarlet leopard jacket against Yayoi Kusama’s infinity of polka dots offers both impeccable taste and irresistible style! Visit Ito at Aosora for even more unforgettable fashion photography! 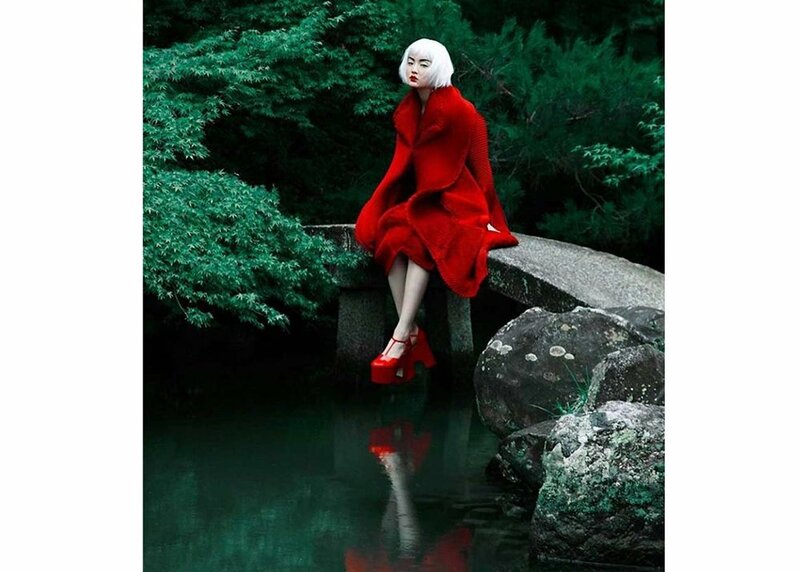 American photographer Erik Madigan Heck’s inspired fashion shoot transports you deep into an alluring Japanese garden. The grounded natural serenity of the garden shows its calming power even against this vibrant scarlet jacket. You can see more of Heck’s renowned work at maisondesprit.com. Japan’s most iconic photographer Nobuyoshi Araki delivers a mystical fashion tableau for Dazed Magazine in 2015. This kimono-clad beauty is model and actress Rila Fukushima, who can also be seen as the fantastically wicked robo-geisha in the latest blockbuster Ghost in the Shell. Interested in Araki’s unique blend of Japanese fashion and sexuality? You can check out his book Araki: Love and Death for a great introduction to his life-long work and his unabashedly subversive point of view! You can also see more of his work among these Radical Art Portraits by Leading Japanese Photographers. Master flower artist and photographer Joichi Teshigahara creates this unique refinement of high fashion and the Japanese art of ikebana, or flower arrangement. The pine branch invigorates the scene with its symbolic associations to youth, while the glittering gold leaf provides a visual link between ancient art and the high wattage of couture fashion. By infusing his photography with the rigor and sensibility of Japanese culture, Teshigahara is shaping an exciting new form of fashion presentation, and promoting great tradition to fans in Japan and around the world. Don’t forget to learn more about Teshigahara’s new works at teshigahara.net. Renowned model Gimico is an inspiring figure on the Japanese fashion scene. This glamorous image was beautifully shot by acclaimed photographer and designer Mika Ninagawa. This fashion shoot was produced for the Medicine and Art Exhibition in 2009 at the Mori Art Museum Tokyo. Gimico’s artificial leg was also designed by Ninagawa using her signature floral motif. You might have caught Gimico’s performance at last year’s closing ceremony for the Rio Paralympics. Follow her fashion happenings at gimico.tokyo! Don’t forget to check out Ninagawa’s other fascinating works at ninamika.com. Yukata is a spring/summer kimono of thinner and lighter material that is worn as a single layer. This eggshell-blue yukata with its butterfly motif is perfect for springtime festivals and cherry-blossom viewing parties. This playful image stars Tokyo-based model Nairu Yamamoto. Follow her on Instagram for a snapshot of Japanese fashion trends. Stop the traffic! Prolific Japanese fashion photographer Jiro Konami captures a smashing Tokyo fashion parade. Hello Kitty road blocks, festive Americana, 70s disco hairdos, what more could you ask for when you venture into the epic metropolis of Shinjuku, Tokyo? This show-stopping fashion editorial was featured in Vogue Japan. Take a look at jirokonami.jp for even more outstanding works! This display of make-up artistry is rich with Japanese symbols. The red rising sun on the model’s forehead, the Hinomaru, adorns the country’s flag and is associated with the sun goddess Amaterasu, from whom the imperial family are said to be descended. The elaborate makeup and hairstyle recall a kabuki actor, where such features distinguish the character’s role and personality in a performance. The silk dress is in the shape and style of traditional kite. The picture doesn’t show the sticking-out tongue that is characteristic of this design, which is intended to ward off evil spirits. For more make-up inspiration from Noboru Tomizawa visit urobon.com. The kawaii aesthetic is not just cute; it can also be an explosive fashion statement! Avant-garde Japanese fashion label Writtenafterwords by Yoshikazu Yamagata has gained a cult following for its unique mix of playful designs and performance art during Tokyo Fashion Week. This exceptional image was styled for the 2013 Spring/Summer collection - The Seven Gods: Clothes from Chaos. The Central St Martins educated designer gives his unique take on pop culture by completely turning it on its head. Definitely the designer to watch out for! Check him out at writtenafterwards.com. There is no mistaking the sleek yet angular silhouette of this Tokyo-based fashion designer. Tokyo Bunka University graduate Leonard Wong likens his work to natural evolution: from the genesis of traditional techniques his creations mutate in form and function, dispassionately casting aside the maladapted to devise ever more perfect futuristic style. This striking image was published in the first issue of freemagazine.jp. Check out more of this designer’s work at leonardwong.jp. The calm simplicity of a Japanese temple provides the perfect contrast for this monochrome number! Model Mika Ehara is stretching her wings on the international fashion stage; she is just back from her first Paris show for Louis Vuitton’s Fall/Winter 2017 collection. Follow Ehara on Instagram for more enlightening Japanese fashion inspiration! Which is your favorite? We'd love to hear from you, let us know in the comments below!